GENEVA, Dec. 7, 2017 /PRNewswire/ -- Memento S.A. ("Memento"), the family office of an investor in Sears Holdings Corporation ("Sears" or, the "Company") (NASDAQ: SHLD), delivered a letter to Sears' board of directors (the "Board") today to express concerns regarding historical patterns of alarming short-selling activity in the Company's shares and to ensure the Board is taking whatever actions may be required to curb any similar short-selling issues that may arise in the future. The Elarof Trust ("Elarof") is a shareholder of Sears Holding Corporation ("Sears" or, the "Company") with nearly 2 million shares of ownership in the Company. Memento is the investment manager of the Elarof Trust and acts as family office of the Swiss-based Spadone family, the beneficiary owner of the Elarof Trust. We are a long-term oriented value investor seeking to identify deeply undervalued opportunities in which boards of directors can take immediate and decisive action to significantly increase shareholder value. Sears represents a significant investment for Elarof, and we have invested in Sears because of our belief in the long-term value of its vast national network of over 1,100 Sears and Kmart retail stores across the United States, the strength of its well-established proprietary brands, its position as the nation's leading provider of appliance and product repair services, and its insurance subsidiary. Our investment in Sears has taken in to consideration many factors, including its significant stakeholders who are closely aligned with its success, such as its vendors, customers, and over 140,000 employees. We believe Sears has the potential for strong financial performance once it addresses a few critical concerns including, among others, the high volume of short-selling activity in its shares. We are writing at this time to highlight certain issues that have been plaguing the Company's shares on-and-off over the past two years that require your immediate attention to prevent further deterioration in shareholder value. We have been closely monitoring these recent developments at Sears and, while we remain optimistic about the Company's potential for long-term growth and shareholder value creation, we seek to engage in constructive discussions with the Company's Board of Directors (the "Board") and management to address our deep concerns surrounding the integrity of the Company's securities ("SHLD shares" or, the "Common Stock"). There have been several occasions over the past two years in which the market has indicated that more short positions exist in the market than SHLD shares available to borrow, as shown by the unusually high volume of short-selling activity relative to the Company's real available float of outstanding shares. For the reasons set forth below, we believe that this shortage of available shares in the marketplace heightens volatility and places downward pressure on the share price. We believe the Board must promptly investigate and address this activity to prevent further decline in shareholder value, including (i) the formation of an independent Board committee to look after the equity ownership interests of all shareholders, (ii) seeking an SEC investigation in to the potential violations of Regulation SHO and a temporary suspension of short-selling in SHLD shares, and (iii) the evaluation of strategic alternatives such as going private. Our interests are aligned with all Sears shareholders in seeking stable and sustainable growth in the value of SHLD shares. As such, we respectfully request the Company provide its investors with adequate assurances that it is taking the steps necessary to effectively address the urgent problem of naked short selling in its shares by establishing sophisticated internal controls and seeking appropriate regulatory action. Naked shorting involves selling a stock short without first locating the shares for delivery at settlement. Such a practice is in violation of Regulation SHO, a 2005 SEC rule. Regulation SHO provides that brokerage firms may not accept orders for short sales without having borrowed the stock or having "reasonable grounds" to believe that it can be secured. This is known as the "locate" requirement. The SEC further noted that the practice of naked short selling can be abusive and drive down share prices. We have observed on several occasions that the number of shares of Common Stock outstanding have fallen below short interest activity as measured by real available float. 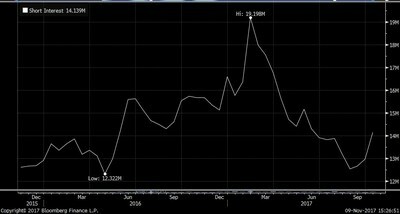 As shown below, short interest in SHLD shares has fluctuated between 12 to 19 million shares in the past two years. In early 2017 we identified that, not taking derivatives into account, there were more stocks lent than the real float, causing a deficit of 3.6 million shares. 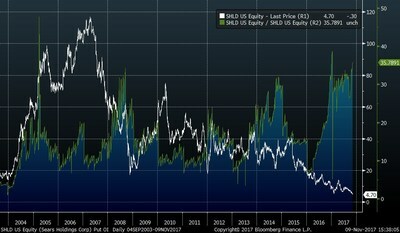 We observed similar behavior in options activity for SHLD shares. Based on our analysis, it would not be possible for market makers to appropriately hedge their investments and, consequently, deliver the shares of options when exercised. If all of the open put or call contracts were exercised, it would be impossible for market makers to locate and deliver shares for settlement within the legally required time period of three business days. Sears' put open interest as a percentage of shares outstanding has fluctuated between 30% to 40% of the Company's market capitalization, indicating that between 30 to 40 million shares are waiting to be delivered for these contracts. This is despite the fact that the Company's real available float remains between 12 to 20 million shares. The call open interest is also rising but remains well below the put open interest. We have learned through our own experience in lending SHLD shares that several institutions/brokers were unable to timely locate shares when we recalled them. It took ten or more days for us to receive our lent shares back. We recalled about 1 million shares twice this year with various institutions/brokers in order to transfer the shares to another counterparty. In both cases our brokers failed to deliver, and the SHLD share price soared between 30 to 100% after our recall. When asked to explain their delay, these institutions/brokers indicated that the shares may have been borrowed by market makers who are subject to less stringent locate requirements and who have the ability to return shares later in certain circumstances as a result. We observed that the SHLD inventories for borrowing stocks were massively below what was reported to the SEC, and Markit informed us that the double-counting of some stocks could cause them to be lent over several times. This is alarming and demonstrates that the same shares may be sold short more than once. We also note that the lending rate of Sears in 2017 has often reached levels close to 100%, indicating a high borrow cost that creates further incentives for naked short selling. This high interest rate raises the specter that market makers are engaged in naked short selling to avoid the high borrow cost associated with covered short sales. Such behavior would violate the requirements of Regulation SHO. As their only recourse to prevent such an outcome, institutions/brokers would be forced to buy SHLD shares in the open market, which risks causing a spike in the price of SHLD shares, a pattern that would artificially distort the Company's value and increase its volatility in the marketplace. The shares of SHLD stock owned by restricted shareholders cannot be borrowed against in the marketplace to cover short sales. Taking this in to account, the real float of Common Stock has fallen below the short interest on several occasions in the past two years. Sears has reason to know this occurs based on the volume of short-selling activity in the marketplace compared to the percentage of outstanding shares restricted from securities lending. It is clear to us based on our own experience in securities lending of SHLD shares and monitoring the Company's real float that there have been repeated instances of widespread naked short-selling in the Company's shares, with the short interest exceeding total Common Stock outstanding when excluding restricted shares. Naked short selling has the effect of placing immense downward pressure on share price over time, since an unlimited supply of any commodity, including SHLD shares, places downward pressure on its price. At a time when Sears' employees, vendors and customers worry about the Company's long-term viability, we believe that the Board must treat this particularly delicate matter with the highest priority. Immediate action is necessary from the Company to prevent further destabilization and depression in the price of SHLD shares. We request that the Board establish an Equity Ownership Committee comprised of independent Board members for the purpose of protecting the interests of all shareholders by monitoring real float versus short interest and seeking stable and sustainable growth in the price of SHLD shares. We further recommend that the Board seek a temporary restriction on short-selling in the SHLD shares to allow the Company to instead focus on more urgent operational priorities. In addition, we believe that these facts warrant an SEC investigation in to the repeated instances of naked short-selling of SHLD shares in violation of Regulation SHO. Lastly, we recommend that the Board consider strategic alternatives such as going private to allow the Company to focus on enhancing long-term shareholder value instead of monitoring short-selling activity in the marketplace. We look forward to continuing our discussions and engaging with the Company to address these troubling concerns on behalf of all shareholders. Memento is a Geneva-based long-term oriented value investor seeking to identify deeply undervalued opportunities in which boards of directors can take immediate and decisive action to significantly increase shareholder value. Memento is the investment manager of the Elarof Trust, a shareholder with nearly 2 million shares of ownership in the Company, and acts as family office of the Swiss-based Spadone family, the beneficiary owner of the Elarof Trust. Memento seeks to engage in constructive dialogue with Sears' Board and management. Memento has retained Olshan Frome Wolosky, LLP as legal counsel to advise on its engagement and discussions with the Company.